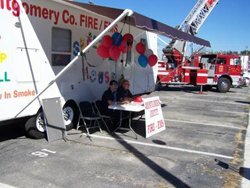 Montgomery County Fire/EMS is very involved in educational activities and spreading the word about fire prevention to our community. 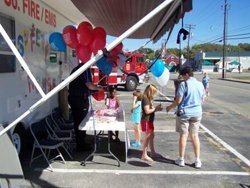 Many times a year we go out into our community and provide classes and demonstrations to help people learn about fire safety. We provide various educational opportunities and programs to all age groups from pre-school aged children to senior citizens and have programs specifically designed to address the issues of each age group, covering areas such as fire and injury prevention. If your company or civic group is interested in having us come to your event, please call (859) 498-1318 between the hours of 9am-5pm to obtain an appointment. We request that you try and give us at least a 2-week notice prior to your event in case there are scheduling conflicts. 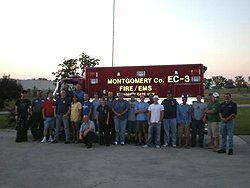 Montgomery County Fire/EMS is happy to accommodate visits to the fire station for area groups. Throughout the year we welcome visits from school groups, scout troops, daycare and church youths, and we strive to give children a positive image of the firefighters and the department in general. 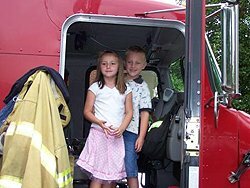 For many kids, this visit to the station as part of an organized tour is the first interaction they have had with a “real” firefighter and we hope to leave them with a lasting impression. Groups should expect to be with us from 20-30 minutes, depending on the age group, and handouts will be given if available. Visitors are provided with a station tour, then can view the fire apparatus and ambulances, and are given time to ask the firefighters questions related to their job, equipment, etc. 1pm-4pm. Other hours may be available depending on the daily duty scheduling but need to be approved by the Battalion Chief on duty. If your group would like to visit us, please fill out the following online form and someone will contact you back regarding scheduling or call our administrative office at (859) 498-1318 between the hours of 9am-5pm and we will be happy to accommodate you. While we happily welcome individuals and small families to stop by without notice, we request that any groups wishing to take a tour please try and give us at least 2 weeks notice prior to your arrival date. Please understand that we provide emergency services to the community and are sometimes called and have to leave the station very quickly, thus ending or temporally suspending the tour. Every effort will be made to finish the scheduled tour, but in some cases we may have to reschedule for a different date. Thank you and we hope to see you soon…. In October 2002 (example) Montgomery County Fire/EMS placed one of its most valuable learning tools into service. Our fire safety trailer is a hands-on mobile classroom affording students a chance to learn and practice fire safety in a realistic, but controlled environment. This scaled-down version of a home has a living room, kitchen, and bedroom, where kids can learn about fire safety and hazards in the home. Once kids enter the trailer, they are shown a 10 minute video on fire safety and then are able to practice what they have just seen on the TV. The trailer is equipped with a simulated stove fire, heated door knobs, smoke alarms, working telephone, and realistic, non-toxic smoke. During the tour, children are taught the importance of having smoke alarms, learning cooking safety, having 2 ways out of a home, stop drop and roll, among other things. 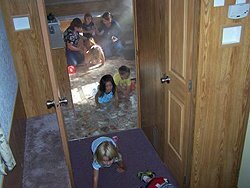 At the end of the tour, children are able to learn the importance of having an emergency exit and are given the opportunity to exit the trailer through a window onto a rope ladder. If your school or group is interested in utilizing the fire safety trailer, please fill out the following online form and someone will contact you back regarding scheduling or call (859) 498-1318 between the hours of 9am-5pm to obtain an appointment. We request that you give us at least a 2-week notice prior to your event in case there are scheduling conflicts. 1. For the best possible protection, keep infants in the back seat, in rear-facing child safety seats, as long as possible up to the height or weight limit of the particular seat. At a minimum, keep infants rear-facing until at least age 1 and at least 20 pounds. 2. 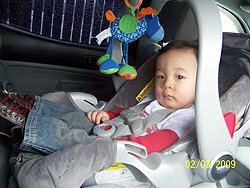 When children outgrow their rear-facing seats (at least age 1 and at least 20 pounds) they should ride in forward-facing child safety seats, in the back seat, until they reach the upper weight or height limit of the particular seat (usually around age 4 and 40 pounds). 3. Once children outgrow their forward-facing seats (usually around age 4 and 40 pounds), they should ride in booster seats, in the back seat, until the vehicle seat belts fit properly. Seat belts fit properly when the lap belt lays across the upper thighs and the shoulder belt fits across the chest (usually at age 8 or when they are 4’9” tall). 4. When children outgrow their booster seats, (usually at age 8 or when they are 4’9” tall) they can use the adult seat belts in the back seat, if they fit properly (lap belt lays across the upper thighs and the shoulder belt fits across the chest). Residents can make an appointment to have their child car seat(s) properly placed, secured, supported and fitted in their car. Car seat checks are conducted by National Child Passenger Safety Board certified technicians. Appointments are recommended but not absolutely required. Allow approximately 15-30 minutes per car seat. Please call us at (859) 498-1318 to schedule an appointment or if you have any questions regarding child safety seats. Montgomery County Fire/EMS does not offer CPR classes as an organization; however we do have CPR instructors on staff that offers classes to the public in their spare time. If you are in need of a class, please call us at (859) 498-1318 and we will put you in contact with an appropriate instructor. We held our first EMT class in 2008 and are happy to say that 28 people graduated the class and were eligible to take the National Registry Exam for certification in Kentucky. Congratulations to all of the students that participated in this class.